Purple Man freaks out as his operatives come under attack from an opposing team. 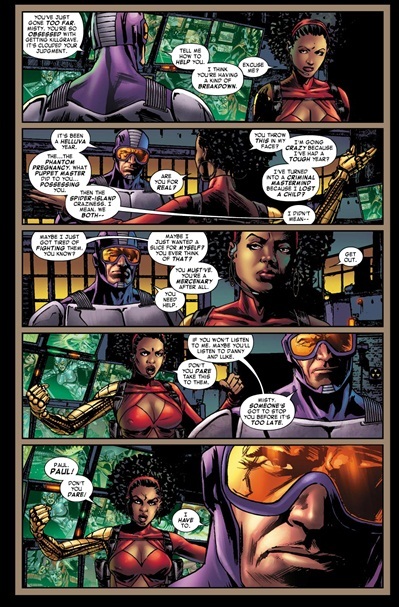 Misty’s team makes off with the loot so purple man sends Head hunter to find out whom, even though she realizes that it’s clearly Misty Knight. 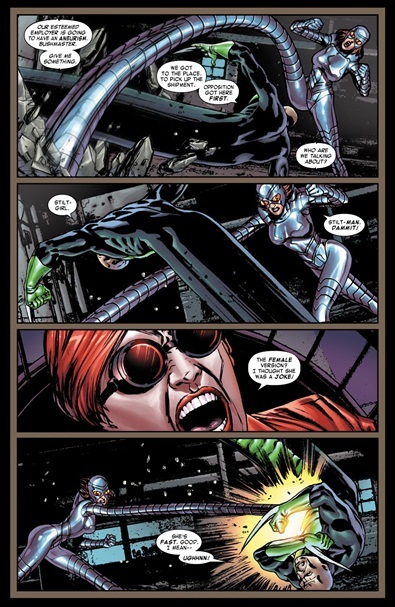 AT the bar with no name she approaches two of Misty’s operatives with Shocker as backup. A fight erupts but Head Hunter uses money to quell the situation. Back at Purple Man’s place he pays them more money for the location of their previous handler. Once he gets it he prepares to strike and moves his men into place. Purple man can’t understand why Misty would be essentially usurping his bid to be the new crime lord of New York. At her warehouse Purple man’s operative watches her from the roof ready to strike. Inside the warehouse Paladin questions Misty’s methods and why she’s doing this. When he threatens to bring in Luke Cage and Iron Fist she knocks him unconscious with her bionic arm. Purple man thinks she just became a credible villain. Cover-Vicious looking cover as Tiger shark takes a few chunks out of Scourge, it looks pretty awesome! Continuity- This issue brings up why Misty would turn to villainy and uses her recent Phantom pregnancy and break up with long time lover Danny Rand/Iron Fist and when her mind and body was commandeered by Puppet Master, the traumatic events of Spider-Island. They also make note that her history with Purple man and the need to have revenge as reasons that she has stepped over the line. Art- Renato Arlem’s art is dark and gritty fitting a story about villains taking each other on. Characterization– Purple man is powerful and a pretty calm guy when things go his way, whenever things go wrong he freaks out big time! It’s happened before and it sure as hell is happening now. Misty Knight also gets a good layered characterization with nods being made to her willingness to step over a moral line in order to enact her brand of justice. Most won’t remember that she slept with Power Master in order to get closer to him and thus bring down his empire while still with Iron Fist and she has killed many times when she sees fit. This villainy is just another means to an end. Or perhaps she just snapped? Accessibility– The small bios littered throughout the book help new readers to know at least the very basics of who’s fighting with whom from page to page. Error- on the inside cover the two teams are detailed and someone made the mistake of putting Bushmaster under Misty Knight’s team when he was in fact working for Purple man. Sorry but for top dollar I expect a perfect issue! Obscure- Again Misty Knight is arguably the biggest name in the book, everyone else is so obscure you’ll need to hit Wikipedia just to keep your sanity. 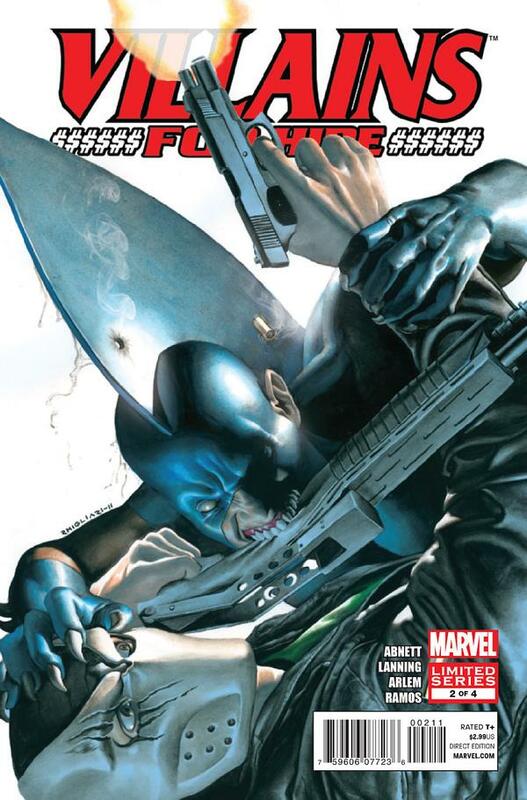 Sales- Good thing marvel billed this as a six issue limited series because the sales figures on issue #1 were easily about the same as the cancelled Static Shock and Mister Terrific.